A sensitive RF probe is very useful in a situation where an oscilloscope is not available. The upper frequency range limit of the probe is due to the length of the ground wire and the stray junction capacitance of the germanium diodes. It is designed for use with a high impedance DC voltmeter, or VOM. Instruments with FET inputs are preferable. Avoid using a long ground lead. Keep the ground lead as short as possible, and attach it as close as possible to the ground point of the circuit under test. A thirty-six (36) inch length of RG-174 coax is recommended for the probes cable. RG-174 is well suited for this task because of its small diameter and flexibility. Also, #16-#18 guage insulated stranded hook-up wire can be used. Twist the wires together. 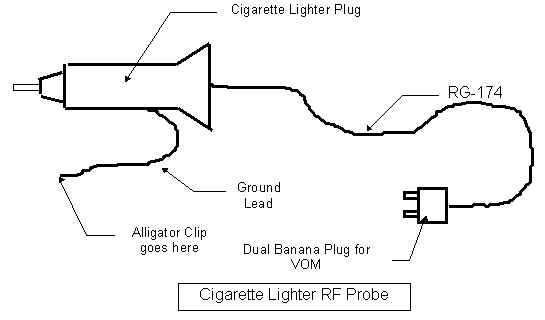 The RF probe is a charge pump. The peak crest value of a signal is stored in the stray capacitance of the coaxial cable. The stray capacitance of the cable is about 50 pF. The 50 pF capacitance of the cable, and the 10 mega-ohm input impedance of an FET VOM implies a DC filter time constant of 500 m Seconds, Accurate measurements are possible at frequencies as low as 100 kHz. Noticeable errors occur at low signal levels because of the forward bias drop of the diodes. Assume a total diode voltage drop of about 0.3 volts. If a standard 20KW /Volt meter is used, then you may have to add a 1000 pF capacitor across the input of the VOM to improve DC filtering. Expect more circuit loading effects, and an increase in the probes lower cut-off frequency. Junk box item??? Coupling and DC blocking capacitor. Make sure the finished assembly holds the internal parts securely to provide an adequate strain relief. The cavities and nooks inside the cigarette lighter housing are useful for wedging the cable and the heat shrink tubing into place. Be careful: Dont crush the diodes! Avoid the use of household silicone sealer. It is corrosive to the solder joints.